To activate the proofreader: click in a text area, press F4 while focused in a text input box, or right-click and select Check Spelling and Grammar from the context menu. After the Deadline should work fine with most text boxes on the web. If the button is not present in a text box, then you can’t use the proofreading feature there. Right click an error to see a menu with suggestions. Many errors have an Explain option that provides more information. You may select Ignore suggestion to ignore a phrase once. Select Ignore always to have this add-on permanently ignore and unmark a phrase. You can configure the proofreading add-on by going to Tools -> Add-ons -> Extensions and Preferences in the After the Deadline add-on. From here you can edit the phrase ignore list and enable extra options in the proofreading add-on. You can change the activate keystroke by clicking the round white box and then pressing the desired keystroke. Remember this keystroke only works in text boxes with the icon in the lower right corner. You can tell AtD to run the proofreader automatically before submitting a form. Select Warn me when form submissions are not proofread first to enable this feature. This feature will ask if you really want to submit a form when errors are present in the text. 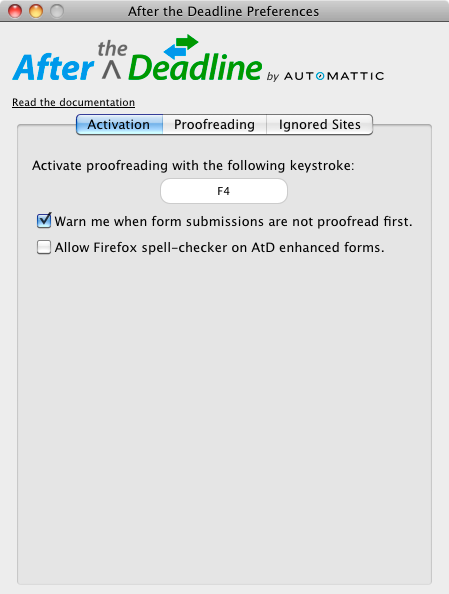 After the Deadline disables the Firefox spell checker in text boxes where After the Deadline works. 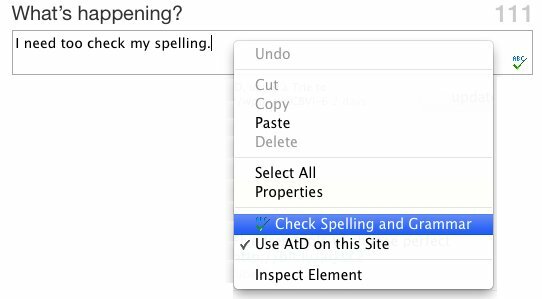 Select Allow Firefox spell checker on AtD enhanced forms to get your Firefox spell checker back. 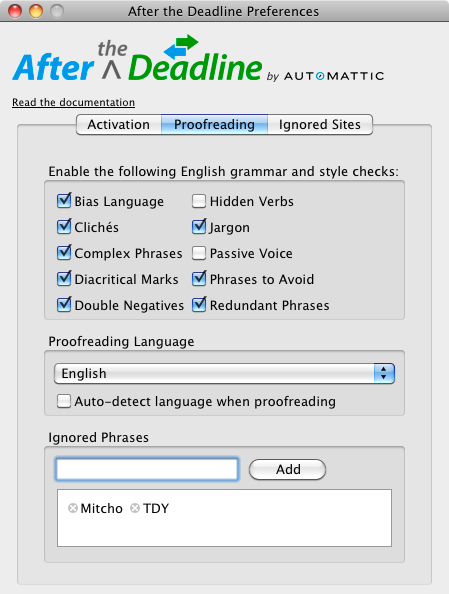 If you write in many languages, select Auto-detect language when proofreading to have After the Deadline detect your language and apply the correct proofreader to it. You have the option to disable this proofreading add-on on certain sites. You can add domains (e.g., wordpress.com) here or deselect Use AtD on this site from the context menu on a site. 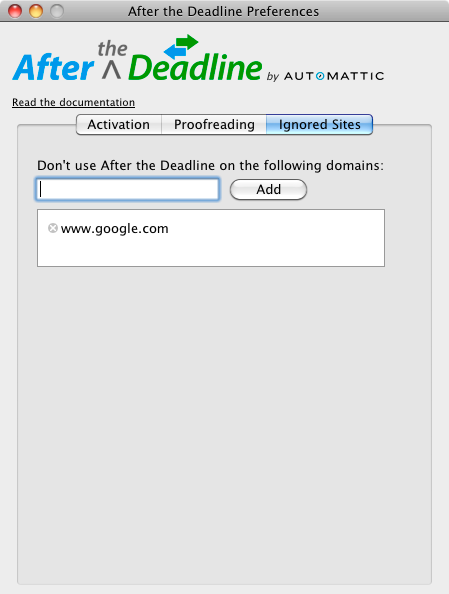 Use this feature to disable After the Deadline if the page or an add-on you use on the site causes conflicts. This extension uses a simple protocol to communicate with an After the Deadline server. You have the option of downloading the After the Deadline technology and running it in low-memory mode on your local computer. If you’d like to delete After the Deadline for Firefox, go to Tools -> Add-ons -> Extensions and select Uninstall under After the Deadline.